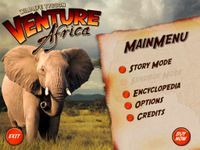 Wildlife Tycoon: Venture Africa is unlike all other Tycoon Games. Set in the African Serengeti, players build a unique ecosystem by buying and breeding animals and by balancing the food and water needs of each diverse species. Unlike other Tycoon Games, there are no people in Venture Africa. You won’t have to build hot dog stands, hire janitors, or balance your checkbook. Build your ecosystem however you want to!